I had a lot of avocadoes to use up today, since I bought them to make guacamole last week, and they were not ripe enough, so I made pico de gallo instead. 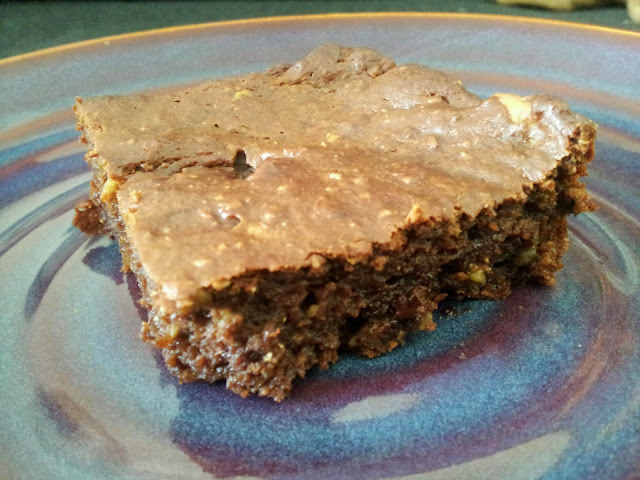 I decided to try avocado brownies, and they turned out to be the tastiest and most decadent thing I've ever baked! Note: I made this recipe a second time, and added 1 tbsp cinnamon, 1 tbsp chili pepper flakes and 1/8 tsp cayenne pepper for a spicy chocolate brownie. Preheat oven to 375 degrees F, and grease a 9x12 cake pan. Combine flour, sugar, cocoa, salt and baking soda in a large mixing bowl. Set aside. In a second mixing bowl, mash avocadoes with a fork until clumps are gone. Add syrup, eggs and water and mix. Pour dry into wet and mix until uniform. Fold in chocolate chips. Pour into cake pan and bake for 37 to 40 minutes.